I got this email from Pinterst. Do you know where I can find this? Seriously..I pin like others play games online, Facebook, post on Instagram. For years I printed out all the ideas I wanted to save in an organized manner in Notebooks. I had them labeled Decorating, Crafts, and Good Things. 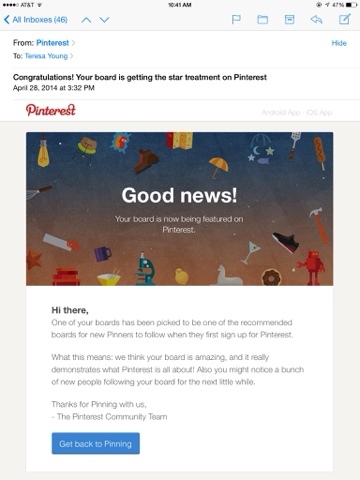 Pinterest was the perfect opportunity to ditch all that and save it online. Love it! Come follow me! Click here!